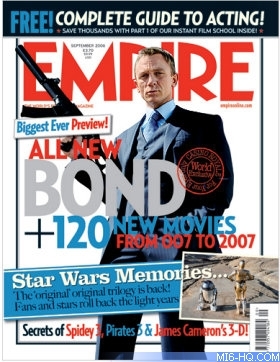 In the September 2006 issue of Empire magazine (which features Bond on the cover), Daniel Craig admits he was not ready for the backlash when taking the Bond role. Empire asked the inevitable question: was Craig taken aback by the intense force of the vitriol against him? Did it catch him off-guard? "Has it been that intense?" she giggles. "Really? I didn't notice that!" Craig looks at her with mock surprise. "You haven't told me, Barbara! What's been going on out there?" "Gee," says Barbara, "I thought we were off the radar!" "Seriously," counters Craig," the honest truth is, no, I didn't really expect it. But I'd prepared myself. I've been acting a while and I think you can't believe the bad stuff and you can't believe the good stuff either. I mean, you still take it in. You can't help it. But I've just been focusing on making a fantastic movie. I've been trying to get into the best physical shape I can, we've been rehearsing. I've been working with Martin very closely. I've been trying to give 110 per cent since the beginning, and after all the fuss, maybe I started giving 115 per cent. I'm giving everything I can." Thanks to `Brokenclaw` for the alert.